NKT cells respond to a variety of CD1d-restricted glycolipid Ags that are structurally related to the prototypic Ag α-galactosylceramide (α-GalCer). 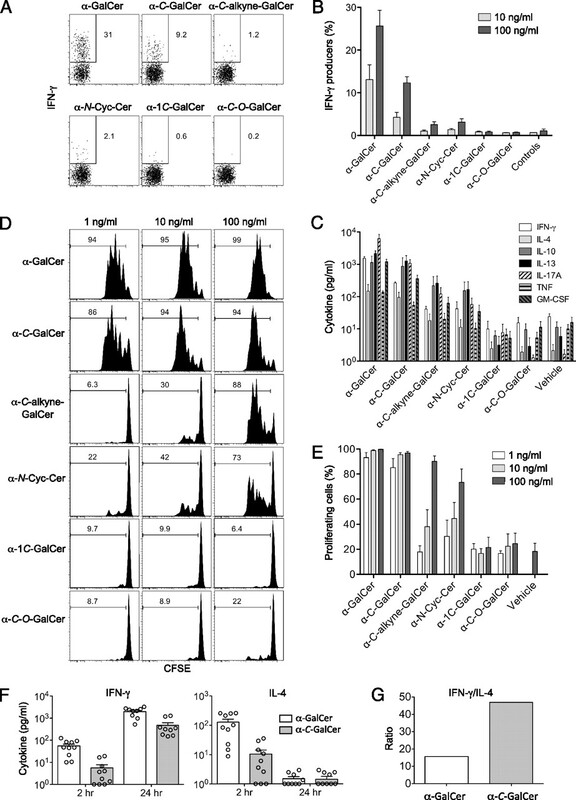 A modified analog of α-GalCer with a carbon-based glycosidic linkage (α-C-GalCer) has generated great interest because of its apparent ability to promote prolonged, Th1-biased immune responses. In this study, we report the activation of spleen NKT cells to α-C-GalCer, and related C-glycoside ligands, is weaker than that of α-GalCer. Furthermore, the Vβ8.2 and Vβ7 NKT TCR affinity for CD1d–α-C-GalCer, and some related analogs, is ∼10-fold lower than that for the NKT TCR–CD1d–α-GalCer interaction. Nevertheless, the crystal structure of the Vβ8.2 NKT TCR–CD1d–α-C-GalCer complex is similar to that of the corresponding NKT TCR–CD1d–α-GalCer complex, although subtle differences at the interface provide a basis for understanding the lower affinity of the NKT TCR–CD1d–α-C-GalCer interaction. Our findings support the concept that for CD1d-restricted NKT cells, altered glycolipid ligands can promote markedly different responses while adopting similar TCR-docking topologies. Natural killer T cells express semi-invariant αβ TCRs that specifically recognize CD1d-restricted glycolipid Ags. Human NKT cells typically express an invariant Vα24-Jα18 TCR α-chain and a Vβ11 TCR β-chain, whereas NKT cells from mice possess an invariant TCR α-chain (Vα14-Jα18) and commonly use up to three different TCR β-chain V genes (Vβ8, Vβ7, and Vβ2) (reviewed in Refs. 1, 2). Upon activation from a variety of stimuli, NKT cells rapidly produce a variety of cytokines that enable them to influence immune outcomes in a broad range of immunological settings (3, 4) (reviewed in Refs. 5–7). The most widely studied glycolipid Ag for activating NKT cells is α-galactosylceramide (α-GalCer) (8), a potent NKT cell agonist and phase I therapeutic (reviewed in Ref. 9). Recently, the structures of NKT TCRs, unliganded (10) and in complex with CD1d–α-GalCer (11, 12), altered glycolipid ligands (AGLs) of α-GalCer (13, 14), α-galactosyldiacylglycerol (15), the self-lipid phosphatidylinositol (16), and β-linked ligands (17) have been determined. Additionally, the structure of a Vα10 NKT TCR in complex with CD1d–α-glucosylceramide has been reported (18). Collectively, these various NKT TCR–CD1d–Ag complexes exhibited a conserved docking strategy in which the NKT TCR was tilted and exhibited a parallel docking mode in relation to the Ag-binding cleft of CD1d, thereby contrasting that of TCR-mediated recognition of the peptide–MHC complex (19). In each case, the NKT TCR α-chain dominated this interaction, with varied contributions from the CDRs (CDRα) loops being observed among some of the Ags (reviewed in Ref. 20). For example, whereas the CDR3α loop of the Vα14 NKT TCRs played a central role in interacting with α-GalCer and AGLs thereof, it played a lesser role in interacting with phosphatidylinositol (16). The role of the TCR-Vβ-chain was restricted to interacting with CD1d, in which the CDR2β loop played a principal role (20–24). However, it has recently been shown that the hypervariable CDR3β loop can, in a sequence-dependent manner, mediate contacts with CD1d and determine the degree of NKT autoreactivity (16, 17, 25). Thus, within a conserved NKT TCR–CD1d–Ag docking topology, variations between the contributions between the CDR loops are observed in an Ag- and TCRβ-dependent manner. NKT TCRs can bind an array of different lipid-based Ags in complex with CD1d, including bacteria-derived lipid Ags and CD1d-presented mammalian lipid molecules. Furthermore, numerous agonist analogs of α-GalCer have been synthesized that exhibit profound effects on NKT cell function (26, 27). Whereas some AGLs have the ability to promote Th2-biased responses (IL-4 > IFN-γ) downstream of NKT cell activation (28, 29), others promote Th1-biased responses (IFN-γ > IL-4) downstream of NKT cell activation. The AGL α-C-GalCer is considered the prototypical Th1-biasing Ag, also known as C-glycoside, which possesses a CH2-based glycosidic linkage rather than the oxygen-based glycosidic linkage of α-GalCer and other natural glycosphingolipids (30). Further, α-1C-GalCer, a nonisosteric α-GalCer analog in which the anomeric carbon of galactose is bonded directly to the sphingolipid backbone, was found to induce a higher IFN-γ/IL-13 ratio in human NKT cells than α-GalCer and α-C-GalCer (31). This C-glycoside modification is intended to provide resistance to enzymatic degradation at the glycosidic linkage by glycosidases, thus increasing the stability of the glycosphingolipid in vivo (30). NKT cell stimulation with α-C-glycoside resulted in a Th1-biased response in vivo, and this is thought to be attributable to more stable presentation by APCs, more efficient activation of NKT cells, and prolonged downstream activation of IFN-γ production by NK cells (32). Consequently, α-C-GalCer provides superior protection against melanoma metastasis and malaria infection in mice (30, 33). It has also been suggested that the altered glycosidic linkage may change the way that this glycolipid sits in the CD1d Ag-binding cleft, resulting in structural differences and changes in NKT TCR interactions and affinity (30). This was supported by a recent study (34) that used a CD1d–α-C-GalCer tetramer dissociation assay, which indicated that CD1d–α-C-GalCer had significantly lower affinity for the NKT TCR than CD1d–α-GalCer. Thus, studies using glycolipid AGLs demonstrate the feasibility of using these to manipulate the NKT cell response, which can translate to more tailored NKT cell-based therapies (reviewed in Ref. 5). However, to achieve more targeted NKT-based therapeutics requires a greater understanding of the molecular basis of antigenic modulation of the NKT cell response. Recently, we have provided insight into NKT TCR fine specificity against a range α-GalCer AGLs, including two Th2-biasing ligands (OCH and C20:2) (13). However, the molecular basis for TCR recognition of Th1-biasing ligands, such as the prototypical α-C-GalCer, and analogs thereof, was less clear. To address this, we report in this paper the structural and functional correlates of NKT TCR recognition of CD1d–α-C-GalCer and analogs thereof. The glycolipid analogs used in this study were synthesized as previously described, although α-1C-GalCer was prepared by a modification of a previously reported route (30, 31, 35). All of the synthesized compounds were characterized by [1H]- and [13C]-nuclear magnetic resonance spectroscopy and high-resolution mass spectrometry. C57BL/6 mice were maintained in the animal facilities of the Department of Microbiology and Immunology, University of Melbourne. All animal experiments were approved by and carried out in accordance with the guidelines of the University of Melbourne Animal Ethics Committee. Splenocytes from C57BL/6 mice were labeled with 2 μM 5,6-CFSE (Molecular Probes) and incubated for 10 min at 37°C. Splenocytes were pulsed with glycolipids at the indicated concentration and cultured overnight (5 × 105 cells/well). Culture media was replaced the next day without further addition of glycolipids. Cells and culture supernatants were harvested at 72 h for proliferation and cytokine analysis. For proliferation analysis, cells were stained with α-GalCer–loaded CD1d tetramer, and the CFSE signal of gated NKT cells was measured. Mice were injected i.p. with 1 μg α-GalCer or α-C-GalCer dissolved in 200 μl PBS and serum cytokines examined at 2 and 24 h using cytometric bead array (CBA) as described below. Splenocyte culture supernatants were collected after 72 h and analyzed using CBA flex sets for mouse IFN-γ, IL-4, IL-10, IL-13, IL-17A, TNF, and GM-CSF (BD Biosciences). Serum samples were collected at 2 and 24 h and analyzed for IFN-γ and IL-4. Splenocytes from C57BL/6 mice were cultured (5 × 105 cells/well) with glycolipid for 8 h, with the final 4 h in the presence of GolgiStop (BD Biosciences). Four replicate wells were pooled for each determination, and cells were surface stained with α-GalCer–loaded CD1d tetramer-PE and TCR-β–FITC, fixed, and permeabilized (Cytofix/Cytoperm Kit; BD Biosciences) prior to staining with anti–IFN-γ–allophycocyanin. The method for cloning, expression, and purification of the mouse Vα14 NKT TCRs has been previously described (11). After the initial refolding and dialysis, the NKT TCR was purified using gel filtration, ion exchange, and hydrophobic interaction chromatography. The refolded Vβ8.2 NKT TCR in 10 mM Tris (pH 8) and 150 mM NaCl was concentrated to 7–10 mg/ml for crystallography experiments. The Vβ8.2 and Vβ7 NKT TCRs were also used in the surface plasmon resonance (SPR) experiments. Mouse CD1d cloned with a BirA and 6X His tag in a dual promoter baculovirus transfer vector, pBacp10pH, was kindly provided by Dr. Mitchell Kronenberg (La Jolla Institute for Allergy and Immunology, CA). Mouse CD1d expression, purification, and lipid loading has been described previously (11). Loading of α-C-GalCer was improved using Triton X-100 (Sigma-Aldrich) at a final concentration of 0.05%. The Vα14-Vβ8.2 NKT TCR–CD1d–α-C-GalCer complex (adjusted to 7 mg/ml in 10 mM Tris [pH 8] and 150 mM NaCl) crystallized in 15–17% PEG 10K, 0.1 M ammonium acetate, and 0.1 M BisTris (pH 5.5) after 2 to 3 d. The crystal morphology was further improved by seeding in 22–25% PEG 400. The crystals were flash frozen in mother liquor containing 25% PEG 400 as the cryoprotectant. The data were collected at the MX2 beamline at the Australian Synchrotron Facility in Melbourne, VIC, Australia. The crystals diffracted to 3.2 Å and belong to the space group P212121. The data were processed using Mosflm version 7.0.5 and scaled using SCALA from the CCP4 suite (36). The crystal structure was solved using the molecular replacement method with the PHASER program from the CCP4 suite. The Vα14-Vβ8.2 NKT TCR–CD1d–α-GalCer complex [Protein Data Bank identification code 3HE6 (11)] minus α-GalCer was used as the search model, and the structure was subsequently refined using REFMAC. To prevent model bias, the Rfree set of the Vα14-Vβ8.2 NKT TCR–CD1d–α-GalCer structure was used in the experimental intensities scaling using SCALA as well as the implementation of the simulated annealing protocol in Phenix (37). Model building was carried out using COOT, and, at a later stage of refinement, translation libration screw parameters were included. The quality of both structures was validated using the Protein Data Bank validation Web site. All molecular graphics representations were created using PyMOL (38). The residues that could not be modeled in the structures were: CD1d, residues 1–6 and 300–302; β2-microglobulin, residue 1; TCR α-chain, residues 1, 134, 135, and 209 to 210; and TCR β-chain, residues 1 to 2 and CDR3β loop 96–102. Electron density of atoms CAG to CAK in the acyl tail and of atoms C7, C8, and C13–C18 in the sphingosine tail was not resolved, and hence, the occupancy was set to zero in the final model. All SPR experiments were conducted at 25°C on a Biacore 3000 instrument (Biacore) using HBS buffer (10 mM HEPES-HCl [pH 7.4], 150 mM NaCl, and 0.005% surfactant P20 supplied by the manufacturer). For kinetic experiments, loaded CD1d was coupled to research grade SA chips to a level of 300–500 resonance units. Increasing concentrations of Vβ8.2 (0.078–10 μM) and Vβ7 TCR (0.19–25 μM) was injected over all flow cells at 50 μl/min for 60 s. The final response was calculated by subtracting the response of the CD1d endogenous complex from the Vβ8.2 or Vβ7–CD1d–Ag complex. BIAevaluation version 3.1 (Biacore) was used to fit the data to the 1:1 Langmuir binding model to calculate the kinetic constants. All measurements were taken in duplicate. For steady-state affinity measurements, loaded CD1d was coupled to research grade SA chips to a level of 2000 resonance units. Increasing concentrations of Vβ8.2 and Vβ7 TCR (0.039–40 μM) were injected over all flow cells at 5 μl/min for 90 s. The final response was calculated by subtracting the response of the CD1d endogenous complex from the Vβ8.2 or Vβ7–CD1d–Ag complex. The equilibrium data were analyzed using GraphPad Prism (GraphPad). A series of α-GalCer analogs with modified α-glycosidic linkages were tested for their ability to stimulate splenic NKT cell proliferation and cytokine production. These α-glycoside analogs included α-C-GalCer (structurally identical to that used in previous publications) with a CH2 group in place of the glycosidic oxygen atom (30); a nonisosteric analog that has one less CH2 group than α-C-GalCer in the link between the sugar and the sphingolipid (α-1C-GalCer) (31); a compound with a rigid triple bond in the link between the sugar and sphingolipid (α-C-alkyne-GalCer) (35); a variant bearing an ether oxygen atom in the linker (α-C-O-GalCer); and an aminocyclitol variant (α-N-Cyc-Cer) (39). The structures of these compounds and that of the O-glycoside standard (α-GalCer) are displayed in Fig. 1. IFN-γ production was examined at 8 h by intracellular cytokine staining (ICS) (Fig. 2A, 2B), and several cytokines were examined at 72 h spleen cell cultures by CBA (Fig. 2C). IFN-γ production at 8 h showed that the strongest response was induced by α-GalCer with ∼25% IFN-γ+ at the highest dose (100 ng/ml), whereas α-C-GalCer only triggered ∼12% of the NKT cells to produce detectable levels of IFN-γ at this dose. Of the other AGLs, α-C-alkyne-GalCer and α-N-Cyc-Cer were ∼10-fold lower again, and α-1C-GalCer and α-C-O-GalCer did not induce IFN-γ staining above background (Fig. 2A, 2B). The CBA data showed a similar trend for other cytokines, with α-C-GalCer inducing 2–5-fold lower amounts compared with α-GalCer (Fig. 2C) and the other AGLs inducing still lower amounts of the other cytokines assayed. There was little difference in the proliferative response to α-C-GalCer compared with α-GalCer, with nearly all cells proliferating at the two highest doses (100 and 10 ng/ml) and only a slight drop in proliferation at the lowest dose (1 ng/ml) (Fig. 2D, 2E). Moderate proliferation was observed for α-C-alkyne-GalCer and α-N-Cyc-Cer, especially at the highest dose, whereas no proliferation (above background) was detected for α-1C-GalCer and α-C-O-GalCer. The reduced IFN-γ response following α-C-GalCer compared with α-GalCer stimulation in vitro seemed inconsistent with α-C-GalCer’s apparent ability to promote Th1-biased responses in vivo (30). Therefore, we compared the serum cytokine response to in vivo challenge with these two glycolipids. Consistent with a recently published study (34), we found that α-C-GalCer induced lower amounts of both IL-4 and IFN-γ production in vivo compared with α-GalCer (Fig. 2F), although the ratio of the peak IFN-γ response (at 24 h) to the peak IL-4 response (at 2 h) still revealed a Th1-like bias (Fig. 2G), similar to that in earlier reports. This is thought to be due to greater in vivo stability of α-C-GalCer and prolonged production of IFN-γ by downstream NK cells in vivo rather than more potent IFN-γ production by NKT cells (30, 34). 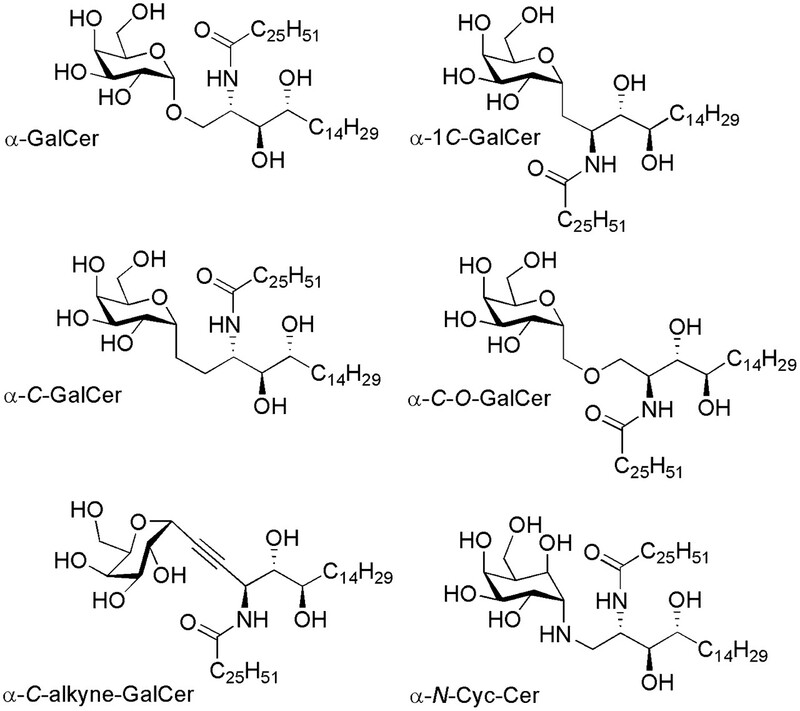 Structures of the glycolipid Ags used. α-GalCer, α-C-GalCer, α-C-alkyne-GalCer; α-1C-GalCer, α-C-O-GalCer, α-N-Cyc-Cer. In vitro stimulation of spleen NKT cells with α-C-GalCer and associated analogs. Spleen cells were cultured with 100, 10, and 1 ng/ml of the glycolipids as indicated. A, After 8 h, cell cultures were harvested and surface labeled with anti–TCR-β and α-GalCer–loaded CD1d tetramer and then fixed and permeabilized for ICS for IFN-γ production. B, The mean ± SEM from three independent experiments testing IFN-γ production by ICS (as per A) are shown. C, Cytokine production at 72 h from spleen cells cultured with the various analogs was determined by CBA. The means ± SEM from three independent experiments are shown. The exception is IL-10, which was only measured in two experiments. D, Representative data showing the proliferation of NKT cells in response to the different ligands were determined by CFSE-labeled spleen cells gating on α-GalCer–CD1d tetramer+ cells after 72 h. E, The CFSE proliferation results for NKT cells (as depicted in C) from four independent experiments (mean ± SEM) are shown. F, Cytokines detected in the serum of mice determined by CBA following the i.p. administration of 1 μg of glycolipid. The combined results from three independent experiments (10 mice/group) are shown. G, The ratio of serum IFN-γ (24 h) to serum IL-4 (2 h). For B, C, and E, the data readings for each individual experiment were the mean of duplicate cultures. Error bars represent SEM. Taken together, these data are consistent with earlier studies suggesting that α-C-GalCer is a weaker NKT cell agonist than α-GalCer (34). Moreover, our data demonstrate that of the AGLs with modified glycosidic linkages tested in this study, α-C-GalCer is the most potent with respect to proliferative response and cytokine production, followed by α-C-alkyne-GalCer and α-N-Cyc-Cer, whereas the α-C-O-GalCer and α-1C-GalCer AGLs were greatly diminished in their potency. Previous studies using a tetramer-binding assay with Vα14+Vβ8.2+ NKT cell hybridomas showed that CD1d–α-C-GalCer tetramer bound to these cells with a much weaker avidity than the CD1d–α-GalCer complexes (34). We determined the affinity of the interaction between the Vβ8.2 and Vβ7 NKT TCRs and CD1d–α-C-GalCer complex (and analogs thereof) using SPR and compared these values to the CD1d–α-GalCer interaction (Fig. 3A–H). The affinity for the Vβ8.2 NKT TCR was ≈2 μM, which was determined by response at equilibrium [equilibrium dissociation constant, KD(eq)] (Fig. 3C) and was significantly weaker than that of the corresponding NKT TCR–CD1d–α-GalCer interaction (300 nM) (Fig. 3A) (Table I). The affinity of the Vβ7 NKT TCR for CD1d–α-C-GalCer was ≈3 μM (Fig. 3D) (and 470 nM for the α-GalCer interaction; Fig. 3B), indicating little difference between the affinity of Vβ8.2 and Vβ7 NKT TCRs for α-C-GalCer. We also determined the rate constants of the interaction between the Vβ8.2 NKT TCR and CD1d–α-C-GalCer. For the NKT TCR–CD1d–α-GalCer interaction, the on-rate was ka = 1.62 × 105 M−1s−1, the off-rate was kd = 0.02 s−1, and accordingly, the t1/2 was long, ∼35 s (13) (Supplemental Fig. 2, Table I). In contrast, for the NKT TCR–CD1d–α-C-GalCer interaction, the on-rate was approximately the same (ka = 2.25 × 105 M−1s−1), yet the off-rate was faster (kd = 0.29 s−1), such that t1/2 of the interaction was only 2.4 s (Supplemental Fig. 2, Table I). Recently, we have shown that for glycosyl-based modifications, the t1/2 on the interaction is linked to the potency of the ligand, which is consistent with α-C-GalCer being a less potent inducer of IFN-γ production from NKT cells compared with α-GalCer (Fig. 2A) (13). We also measured the affinity of the interaction between the Vβ8.2 and Vβ7 NKT TCRs and the other AGLs depicted in Fig. 1 (Fig. 3E–H, Table I). For the five AGLs tested, the affinities between the Vβ8.2 and Vβ7 NKT TCRs were similar (ranging from ≈1.6–4 μM), indicating no marked hierarchical recognition properties, whereas Vβ8.2 NKT TCRs trended toward preferential recognition of α-GalCer when compared with Vβ7 NKT TCRs (Table I) (24). The binding affinity for the α-C-alkyne-GalCer and α-N-Cyc-GalCer analogs were similar to α-C-GalCer (Table I), indicating that the modifications did not appreciably affect the affinity of the interaction, despite the differing stimulatory activity to these Ags. This finding is consistent with previous studies in which other factors (e.g., Ag processing and presentation mechanisms and ligand stability), besides binding affinity of the NKT TCR, can contribute to the biological responses of NKT cells (34, 40). Nevertheless, consistent with previous studies on α-GalCer analogs (13), the levels of cytokines produced by the NKT cells broadly reflects the NKT TCR affinity of these α-C-glycoside ligands. Binding analysis of Vβ8.2 and Vβ7 to CD1d–Ag. Equilibrium binding response curve for Vβ8.2 TCR to CD1d–α-GalCer (A), CD1d–α-C-GalCer (C), CD1d–α-C-alkyne-GalCer (E), and CD1d–α-N-Cyc-Cer (G) and Vβ7 TCR to CD1d–α-GalCer (B), CD1d–α-C-GalCer (D), CD1d–α-C-alkyne-GalCer (F), and CD1d–α-N-Cyc-Cer (H). The equilibrium dissociation constant [KD(eq)] by fitting to one-site binding model. All results are shown as one representative experiment performed in triplicate (representative of two to three experiments). No measurable binding affinity was observed for the α-1C-GalCer and the α-C-O-GalCer analogs (Table I), consistent with the lack of NKT cell stimulation in response to these ligands (Fig. 2). Taken together, our findings suggest that these two analogs are not CD1d-restricted Ags for mouse NKT cells. Because the ceramide base and the α-galactosyl head group of α-C-GalCer is identical to α-GalCer, the only difference is the CH2 versus O-based glycosidic linkage; thus, it is not obvious why there would be such a large difference in TCR binding affinity to this glycolipid analog. To determine how the NKT TCR binds to CD1d–α-C-GalCer and to understand why the affinity of this interaction was much weaker than the NKT TCR–CD1d–α-GalCer interaction, we expressed and refolded the Vβ8.2 NKT TCR and ligated it to CD1d specifically loaded with α-C-GalCer. We subsequently determined the structure of Vα14Jα18-Vβ8.2 NKT TCR–CD1d–α-C-GalCer complex to 3.2 Å resolution to an Rfac and Rfree of 22.6 and 28.9%, respectively (Fig. 4A, Supplemental Table I, accession number 3TN0). The initial phases clearly showed unbiased electron density for α-C-GalCer head group (Supplemental Fig. 1). The electron density at the NKT TCR–CD1d–α-C-GalCer interface was unambiguous, with the exception of a mobile CDR3β loop (residues 94–104) and side-chains of Leu99α and Arg103α of the CDR3α, which were not resolved in the final structure. Consistent with this, some previous Vβ8+ NKT TCR–CD1d–Ag structures have exhibited mobility in the CDR3β loop (11, 13). The structure of the NKT TCR–CD1d–α-C-GalCer complex enabled us to compare it to the closely related NKT TCR–CD1d–α-GalCer complex that had been solved to similar resolution (11) (Fig. 4A, 4B). Further, the NKT TCR–CD1d–α-C-GalCer and NKT TCR–CD1d–α-GalCer complexes crystallized in identical space groups and isomorphous unit cell dimensions, and thus, any structural differences observed between these two NKT TCR–CD1d–Ag complexes can be attributed to the impact of the specific modification of the α-C-GalCer. Structure of Vα14-Vβ8.2 NKT TCRs in complex with CD1d–Ag. A, Vα14-Vβ8.2 NKT TCR in complex with CD1d–α-C-GalCer (accession number 3TN0). α-C-GalCer, blue; CD1d heterodimer, gray; Vα14, cyan; Vβ8.2, green; CDR1α, purple; CDR3α, yellow; CDR1β, teal; CDR2β, ruby; CDR3β, not modeled. B, Vα14-Vβ8.2 NKT TCR in complex with CD1d–α-GalCer (from Ref. 11, accession number 3HE6). α-GalCer, magenta; CDR3β, orange; CD1d, Vα14, Vβ8.2, CDR1α, CDR3α, CDR1β, and CDR2β color coding as in A. C, Footprint of Vα14-Vβ8.2 on the surface of CD1d–α-C-GalCer. α-C-GalCer is shown in spheres. CD1d, α-C-GalCer, and CDR loops color coding as in A. D, Footprint of Vα14-Vβ8.2 on the surface of CD1d–α-GalCer. CD1d, α-GalCer, and CDR loops color coding as in A and B. The NKT TCR adopted the docking mode observed for the NKT TCR–CD1d–α-GalCer complex (11, 12), indicating that the α-C-GalCer did not cause a significant repositioning of the NKT TCR. Namely, within the NKT TCR–CD1d–α-C-GalCer complex, the NKT TCR bound approximately parallel to, and above, the F′-pocket of the CD1d–Ag binding cleft (Fig. 4C). The buried surface area (BSA) upon ligation is ≈690 Å2, which is lower than BSA ≈760 Å2 for the complex with α-GalCer (Fig. 4C, 4D). The lower BSA is attributable to the increased mobility of the CDR3α loop within this complex, in which the Leu99α and Arg103α side chains were not resolved in the electron density and thus were not included in the final refined model. In the NKT TCR–CD1d–α-GalCer complex, Leu99α and Arg103α make specificity-governing contacts with CD1d. Thus, the increased mobility of Leu99α and Arg103α in the NKT TCR–CD1d–α-C-GalCer complex would contribute to the lower affinity of this interaction. Similar observations were observed in the structure of the NKT TCR–CD1d–α-glucosylceramide complex, in which increased mobility of the CDR3α loop was also attributed to a lower affinity interaction (13). Within the NKT TCR–CD1d–α-C-GalCer interface, the TCR α-chain contributes 68% of the BSA, in which the CDR1α and CDR3α contributed 20 and 48% of the BSA, respectively. As observed previously in the Vα14-Vβ8.2 NKT TCR–CD1d–Ag structures, the Vβ8.2 interactions were mediated solely via the CDR2β (32% BSA). These values are very similar to those in the NKT TCR–CD1d–α-GalCer interaction, with the CDR1α, CDR3α, and CDR2β loops contributing 17, 57, and 26%, respectively (11). 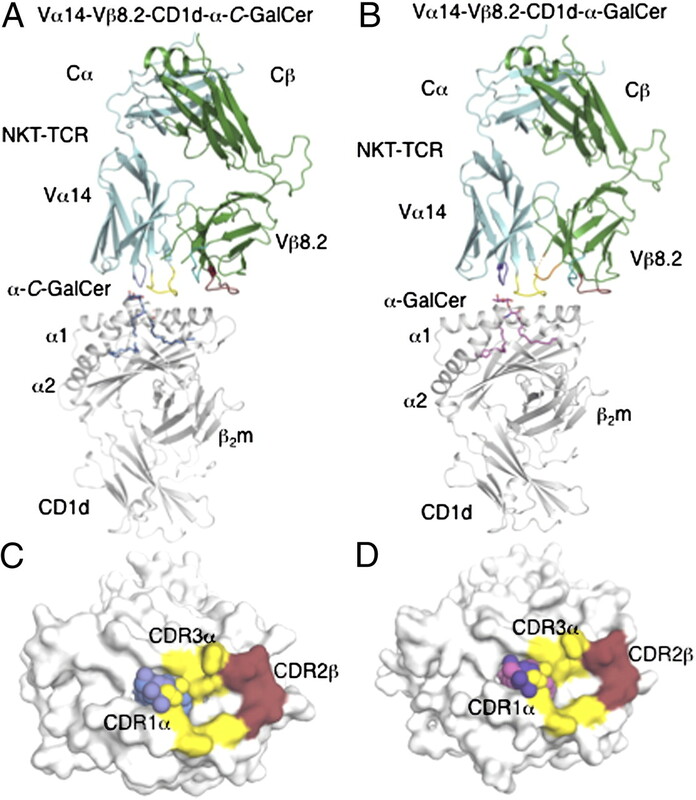 The slightly higher BSA of the CDR2β in the NKT TCR–CD1d–α-C-GalCer complex arises from small differences in the Vα-Vβ juxtapositioning between the two ternary complexes. The CDR2β interactions include the conserved interactions mediated by Tyr48β, Tyr50β, and Glu56β, which have been observed in all Vβ8.2 NKT TCR–CD1d–Ag complexes solved to date (11, 13). Regarding the TCR α-chain, most of the interactions observed in the NKT TCR–CD1d–α-GalCer complex were preserved in the NKT TCR–CD1d–α-C-GalCer complex (11), thereby collectively providing a focused network of polar and salt-bridging interactions with CD1d (Table II). However, in comparison with the NKT TCR–CD1d–α-GalCer complex, there was a loss of an H-bond between main-chain Gly96α and Asp153 of the α2 helix of CD1d in the NKT TCR–CD1d–α-C-GalCer complex (Fig. 5A, 5B). The loss of this interaction was attributable to a 1 Å backbone shift at the Gly96α tip of the CDR3α loop, which was a result of a small shift in the head group position at the C3 carbon, whereby α-C-GalCer sat in a higher position at this carbon compared with that of α-GalCer (Fig. 5C). Vα14-Vβ8.2 NKT TCR-mediated interactions with mouse CD1d–glycolipid interface. A, Vα14-Vβ8.2 NKT TCR CDR3α- and mouse CD1d (mCD1d)-mediated contacts with α-C-GalCer. α-C-GalCer, blue; CDR3α, yellow; CD1d, gray. B, Vα14-Vβ8.2 NKT TCR CDR3α- and CD1d-mediated contacts with α-GalCer. α-GalCer, magenta; CDR3α and mCD1d color coding as in A. H-bonds are shown with black dashed lines. C, Superposition of mouse Vα14-Vβ8.2 NKT TCR–CD1d–α-C-GalCer and Vα14-Vβ8.2 NKT TCR–CD1d–α-GalCer complexes. Vα14Vβ8.2 NKT TCR–CD1d–α-C-GalCer is shown in cyan, and Vα14-Vβ8.2 NKT TCR–CD1d–α-GalCer is shown in pink. The replacement of the glycosidic O linkage in α-GalCer to a hydrophobic CH2 linkage in α-C-GalCer does not result in a major head group movement. D, Vα14-Vβ8.2 NKT TCR CDR1α- and CDR3α-mediated contacts with α-C-GalCer. α-C-GalCer, blue; CDR1α, purple; CDR3α, yellow; mCD1d, gray. H-bonds are shown with black dashed lines. Similar to the CD1d–α-GalCer interactions observed in the NKT TCR–CD1d–α-GalCer complex, the 2′-OH and 3′-OH groups of the galactosyl moiety of α-C-GalCer H-bonded to Asp153, whereas the 3′-OH and 4′-OH of the sphingosine chain H-bonded to Asp80 (11). However, due the presence of a CH2 linkage in α-C-GalCer instead of a glycosidic O linkage in α-GalCer resulted in loss of the H-bond between Thr156 and the lipid (Fig. 5A, 5B). 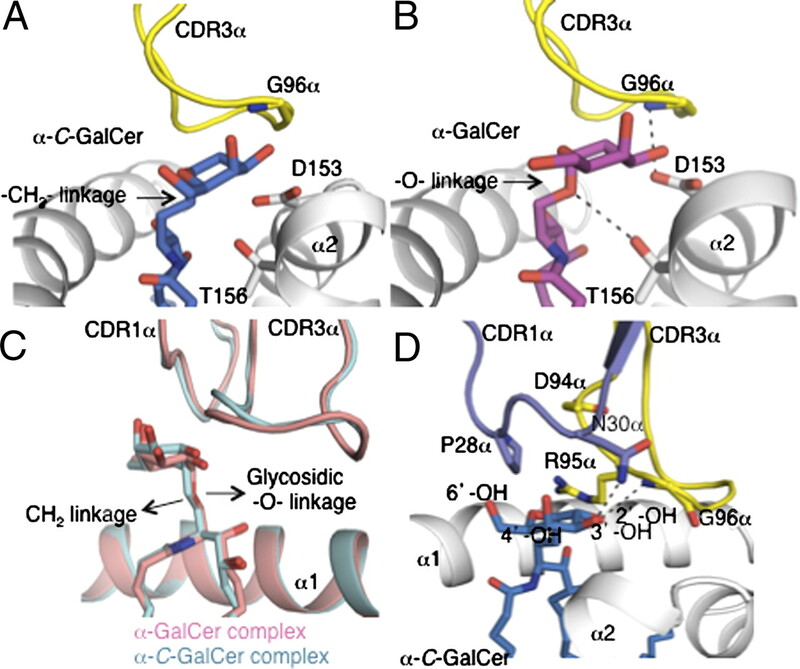 As previously observed with Vβ8.2 NKT TCRs, the CDR1α and CDR3α loops interact with the galactosyl head group of α-C-GalCer (11). Within the ternary complex, replacement of the glycosidic oxygen in α-GalCer with a CH2 group in α-C-GalCer caused no major reorientation of the head group (Fig. 5C). In comparison with NKT TCR–CD1d–α-GalCer, most of the interactions between α-C-GalCer and the TCR are maintained. Namely, the galactose ring sat underneath the CDR1α loop and abutted the CDR3α loop, forming van der Waals (VDW) contacts on one face of the sugar ring. Further, Gly96α H-bonded to the 2′-OH group, whereas Asn30α forms H-bonds to the 3′-OH group of the galactose ring. However, dissimilar to the NKT TCR–CD1d–α-GalCer complex, the H-bond between Asn30α and the 4′-OH group was absent, which was attributable to the slightly differing orientations of the respective galactosyl head groups (11) (Fig. 5D). As we have recently shown that the 4′-OH group of α-GalCer is more critical than the 3′-OH group in mediating contacts with the Vβ8.2 NKT TCR, the observation of a loss of a H-bond between the 4′-OH group of α-C-GalCer and the NKT TCR is consistent with the lower affinity of the interaction compared with the α-GalCer interaction (Table I) (13). The structures of a number of NKT TCR–CD1d–Ag complexes determined to date have shown that a conserved docking topology underpins the interaction, regardless of the nature of the bound antigenic ligand or, indeed, Vα-Jα and Vβ usage (13–18). Nevertheless, some CD1d-restricted ligands can exert markedly differing biological effects, and the α-C-GalCer ligand is considered the prototypical Th1-biasing ligand. Our results show that the NKT TCR–CD1d–αGalCer and α-C-GalCer docking topologies are very similar. We provide a clear molecular basis for the lower affinity interaction observed with α-C-GalCer compared with α-GalCer, which was largely attributable to reduced contacts between the NKT TCR and the sugar head group of α-C-GalCer as well as the α-2 helix of CD1d. Similarly, in comparison with the Vβ8.2 NKT TCR–CD1d–α-GalCer complex, Aspeslagh et al. (14) reported a loss of an interaction between a Vβ8.2 NKT TCR and CD1d–C-GalCer, in which a loss of H-bond between Arg95α to the 3-OH of phytosphingosine was observed in comparison with the loss of H-bond between Asn30α of the Vβ8.2 NKT TCR to 4′-OH of galactose reported in this study. These differences could be attributable to the differing CDR3β sequences used in the respective studies, which is consistent with the much higher affinity (247 nM) for α-C-GalCer reported by Aspeslagh et al. (14) in contrast to the affinity measurements reported in this paper (2 μM). Regardless, the diminished contacts in the NKT TCR–CD1d–α-C-GalCer complex most likely explains the reduced effects on NKT cell activation and cytokine production against α-C-GalCer and its related analogs tested in this study. Moreover, these reduced contacts were consistent with the much shorter t1/2 of the interaction when compared with the NKT TCR interaction with CD1d–α-GalCer. However, despite this, the proliferative response of NKT cells to α-C-GalCer was only slightly reduced compared with α-GalCer, which is consistent with our earlier report showing that TCR affinity for glycolipid analogs does not directly correlate with proliferation. This may also reflect an earlier report demonstrating the sustained in vivo response to this analog despite reduced short-term cytokine production (34). Taken together, our molecular and functional data for α-C-GalCer and analogs thereof, in combination with an earlier report (34), highlight the fact that even subtle changes in glycolipid structure can have profound effects on TCR–glycolipid–CD1d contacts and the affinity of the NKT TCR interaction. In turn, this can clearly affect the initial stages of NKT cell activation and cytokine production, whereas the duration and downstream effects of NKT cell activation appear to be less associated with the affinity of the ligand and more closely linked to the stability of its presentation. Collectively, our findings provide a basis for understanding the fine specificity of the NKT cell-mediated response that will be of enormous value in tailor making NKT cell AGLs for therapeutic benefit. We thank the synchrotron staff at the MX2 beamline of the Australian synchrotron for assistance with data collection and David Taylor and the animal house staff at the University of Melbourne, Department of Microbiology and Immunology, for animal husbandry assistance. We also thank the National Institutes of Health tetramer facility for providing us with α-C-GalCer and Maria Sandoval for technical assistance. This work was supported by the Cancer Council of Victoria, the National Health and Medical Research Council of Australia, and the Australian Research Council. This work was also supported by National Institutes of Health Grants AI45889 (to S.A.P.) and HL083187 (to R.B.). G.C. is supported by a Cancer Research Institute predoctoral scholarship. A.L. and A.R.C. are supported by the Spanish Ministry of Sciences and Innovation and Fondo Europeo de Desarrollo Regional Grant CTQ2008-01426. D.I.G. is supported by a National Health and Medical Research Council of Australia Principal Research Fellowship. J.R. is supported by an Australian Research Council Federation Fellowship. The structure coordinates presented in this article have been submitted to the Protein Data Bank (Utrecht, The Netherlands) (http://www.rcsb.org) under accession number 3TN0.
. 2004. NKT cells: what’s in a name? Nat. Rev. Immunol. 4: 231–237.
. 2011. Invariant NKT cells are required for airway inflammation induced by environmental antigens. J. Exp. Med. 208: 1151–1162.
. 2011. Innate and cytokine-driven signals, rather than microbial antigens, dominate in natural killer T cell activation during microbial infection. J. Exp. Med. 208: 1163–1177.
. 2004. Going both ways: immune regulation via CD1d-dependent NKT cells. J. Clin. Invest. 114: 1379–1388.
. 2011. New ways to turn on NKT cells. J. Exp. Med. 208: 1121–1125.
. 1997. CD1d-restricted and TCR-mediated activation of valpha14 NKT cells by glycosylceramides. Science 278: 1626–1629.
. 2010. Synthetic iNKT cell-agonists as vaccine adjuvants—finding the balance. Curr. Opin. Immunol. 22: 417–424.
. 2006. A structural basis for selection and cross-species reactivity of the semi-invariant NKT cell receptor in CD1d/glycolipid recognition. J. Exp. Med. 203: 661–673.
. 2009. Differential recognition of CD1d-alpha-galactosyl ceramide by the V beta 8.2 and V beta 7 semi-invariant NKT T cell receptors. Immunity 31: 47–59.
. 2007. CD1d-lipid-antigen recognition by the semi-invariant NKT T-cell receptor. Nature 448: 44–49.
. 2011. Galactose-modified iNKT cell agonists stabilized by an induced fit of CD1d prevent tumour metastasis. EMBO J. 30: 2294–2305.
. 2010. The Vα14 invariant natural killer T cell TCR forces microbial glycolipids and CD1d into a conserved binding mode. J. Exp. Med. 207: 2383–2393.
. 2011. A molecular basis for NKT cell recognition of CD1d-self-antigen. Immunity 34: 315–326.
. 2011. Recognition of β-linked self glycolipids mediated by natural killer T cell antigen receptors. Nat. Immunol. 12: 827–833.
. 2011. A semi-invariant Vα10+ T cell antigen receptor defines a population of natural killer T cells with distinct glycolipid antigen-recognition properties. Nat. Immunol. 12: 616–623.
. 2008. The fidelity, occasional promiscuity, and versatility of T cell receptor recognition. Immunity 28: 304–314.
. 2010. Antigen recognition by CD1d-restricted NKT T cell receptors. Semin. Immunol. 22: 61–67.
. 2007. Germline-encoded recognition of diverse glycolipids by natural killer T cells. Nat. Immunol. 8: 1105–1113.
. 2009. Adaptability of the semi-invariant natural killer T-cell receptor towards structurally diverse CD1d-restricted ligands. EMBO J. 28: 3579–3590.
. 2008. A minimal binding footprint on CD1d-glycolipid is a basis for selection of the unique human NKT TCR. J. Exp. Med. 205: 939–949.
. 2009. T cell receptor CDR2 beta and CDR3 beta loops collaborate functionally to shape the iNKT cell repertoire. Immunity 31: 60–71.
. 2010. Innate-like control of human iNKT cell autoreactivity via the hypervariable CDR3beta loop. PLoS Biol. 8: e1000402.
. The stimulating adventure of KRN 7000. Org. Biomol. Chem. 9: 3080–3104.
. 2005. Modulation of CD1d-restricted NKT cell responses by using N-acyl variants of alpha-galactosylceramides. Proc. Natl. Acad. Sci. USA 102: 3383–3388.
. 2003. Superior protection against malaria and melanoma metastases by a C-glycoside analogue of the natural killer T cell ligand alpha-Galactosylceramide. J. Exp. Med. 198: 1631–1641.
. 2006. Synthesis and evaluation of an α-C-galactosylceramide analogue that induces Th1-biased responses in human natural killer T cells. ChemBioChem 7: 1750–1756.
. 2007. Combined natural killer T-cell based immunotherapy eradicates established tumors in mice. Cancer Res. 67: 7495–7504.
. 2010. Mechanisms for glycolipid antigen-driven cytokine polarization by Valpha14i NKT cells. J. Immunol. 184: 141–153.
. 2010. Synthesis of immunostimulatory alpha-C-galactosylceramide glycolipids via Sonogashira coupling, asymmetric epoxidation, and trichloroacetimidate-mediated epoxide opening. Org. Lett. 12: 2974–2977.
. 2008. Automated structure solution with the PHENIX suite. Methods Mol. Biol. 426: 419–435. 2002. The PyMOL molecular graphics system. Available at: http://www.pymol.org. Accessed: March–June 2011.
. 2011. Galacto-configured aminocyclitol phytoceramides are potent in vivo invariant natural killer T cell stimulators. J. Am. Chem. Soc. 133: 12079–12084.